Former world cruiserweight champion Tony Bellew has confirmed his retirement from boxing, 12 days after his defeat by Oleksandr Usyk. In the aftermath of the eighth-round loss to the Ukrainian, the Briton said his career in the ring was "over". 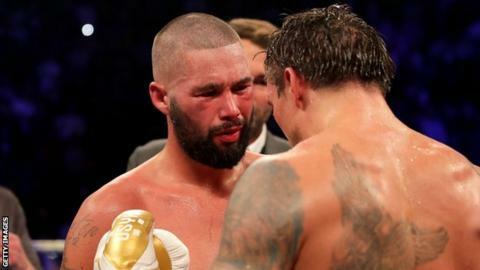 Everton fan Bellew said his greatest achievement was beating Ilunga Makabu at his beloved Goodison Park in 2016 to win the WBC cruiserweight title. "There will be no more fighting from me," said Bellew, who retires aged 35. The Liverpudlian, who won 30 of his 34 professional fights, added: "The only thing you will see me doing from here on in is trying to act sensible and being myself. I have had a fantastic career and have realised my dreams." After one defence of his cruiserweight title, Bellew stepped up to heavyweight and twice beat compatriot David Haye in two lucrative fights in 2017 and 2018, before returning to cruiserweight to face Usyk. Bellew, who made his professional debut in 2007, also held the British and Commonwealth light-heavyweight titles and European cruiserweight title in his career. When asked what purse would tempt him out of retirement, Bellew added: "Eddie [Hearn] gets £100m together for me and offers me one more fight, what do I say? Wow, wow - that is probably what I would say. Wow, wow and then walk into the missus and say 'Eddie has come on board with £100m' and she would probably hand me divorce papers. "Money is good but money comes and goes, that is the best way of saying it." Bellew enjoyed starring in 2015 film Creed, a sequel to the Rocky film series, and he says he would consider other opportunities of that nature. At present, however, his enthusiasm does not extend to following football manager Harry Redknapp and former two-weight world champion Chris Eubank into the Australian jungle for ITV's I'm A Celebrity... Get Me Out Of Here! "I'd be the worst screamer you've ever seen," he told BBC Radio 5 live. "If someone put a huge spider on me I'd probably have a heart attack. They could have a death on camera if I went in there. "I'm not scared of house spiders but ones the size of those [on the show] have got to be able to do some damage. I'd be screaming and kicking. It's truly frightening. "Most of the other things wouldn't bother me - but one thing I am petrified of is heights. "Please just let me live and disappear."